Located in the heart of Fiordland National Park, Milford Sound forms part of the Te Wahipounamu World Heritage site. Explore the stunning fiord by air and water during a half-day excursion. The exhilarating, round-trip helicopter flight from Queenstown includes a glacier landing on Mt. Tutoko. Perhaps spot dolphins, seals, and penguins during an unforgettable cruise. Select from three departure times at booking. Then board a modern 6-seater Airbus Squirrel after a hotel transfer to the helicopter base in Queenstown. 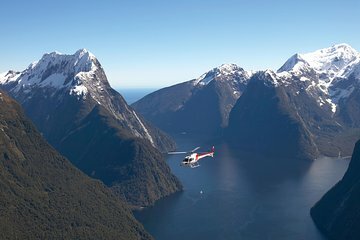 Slip on your audio headset to hear the pilot's commentary as you take off for Milford Sound. Upon landing at the famous fiord, embark on a scenic cruise that takes you past Milford's sheer cliffs and gushing waterfalls. Search the waters for dolphins, seals, and penguins. On arrival back in Queenstown, a courtesy shuttle transfers you back to your hotel.